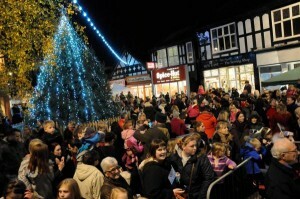 This year Northwich Christmas Lights Switch on 2014 is set to be an event to remember – a Christmas extravaganza to start the festive season in Northwich with a bang! Northwich’s Business Improvement District (BID), Northwich Independent Retailers Association (NIRA) and Cheshire West and Chester Council have got together to organise a program of events to entertain local residence and attract visitors from the surrounding area. A firework finale at 7pm at Northwich library. The market will feature more than 60 stalls of Christmas crafts, tasty treats and face painting while entertainment on the library steps is set to include students from Mid Cheshire College’s Christmas production, the Sir John Deane’s College brass band, carol singing from both the Joshua Tree and the Girl Guides and music from Roberts Bakery Band. From 1pm there will be fairground rides in Witton Street and free tractor and trailer rides through the Christmas lights. Father Christmas will parade around Northwich with stilt walkers in the morning, enjoy a tractor and trailer ride himself at 1pm and then meet children in his grotto from 2pm. More than 200 children will take part in the lantern parade, led by a samba band, which will form up at Waitrose and walk along Dane Street, High Street and Witton Street to the library where the Christmas lights will be officially switched on. If you want more information you can find a map and programme of events here. This article was added on Wednesday, November 26th, 2014 at 5:08 pm and is categorised under Cheshire News, General News, Northwich Events. Both comments and pings are currently closed. Error: Error validating access token: Session has expired on Saturday, 09-Mar-19 13:12:58 PST. The current time is Thursday, 25-Apr-19 05:54:06 PDT.